Disclaimer: The following bite is my perspective on Cronos Group; this is not an endorsement or a recommendation for investors to buy, sell or short the stock. Cronos Group Inc. (CRON) shares are trading at $19.08, up 3.86% from yesterday. Over the last month, Cronos (CRON) returned -12.27%. The company has been active in the deal-making space, having taken a minority stake in Seth Rogen's cannabis venture. Rogen is a well-established Hollywood actor, whose role in The Disaster Artist got him a Golden Globe award for best motion picture. Cronos is still tiny revenue-wise, but it has experienced explosive sales growth. However, the firm has profitability and cash flow challenges. So what is my take on Cronos? Here are the things I like about it. 1. The stock has cooled off in the last month. Jumping in now is probably a better idea than doing this a month ago. 2. I also like Cronos' focus on high-margin alternative products, which make it easier to differentiate from companies such as Tilray and Aurora. 3. Cronos has a solid management team, focused on deals and partnerships. It closed a $2.4 billion (in Canadian dollars) investment with Altria, which has now owns 45% of the stock in Cronos. The partnership focus is great, although at times it makes me wonder whether the company can execute well with so many plays in action. Which brings me to the cons of investing in Cronos. 1. No production capacity. In my view, production is core, and if it is outsourced, it makes me wonder whether Cronos is just a well-executed sales and market machine. 2. The earnings release appeared a bit odd--the results for the quarter were hidden at the bottom. The management talk was centered around Cronos' positioning for the future. 3. Note that CRON average analyst price target ($20.42) is only 7.02% above its current price ($19.08). Just another data point. I don't own the stock and I am going to sit out this rally. Given the pros and cons above, I just think it's too risky for me to jump in. 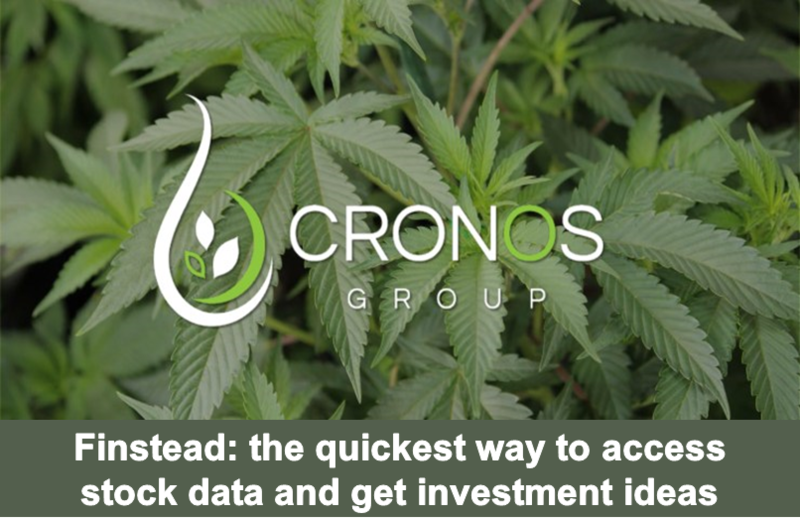 For the latest price and information on Cronos Group Inc., visit Finstead and ask for "CRON analysis", "CRON news" or just "CRON". Cronos Group Inc. (CRON) shares are trading at $12.62, up 7.50%. The stock is trading just 8% down from its recent peak of $13.75. What's driving CRON stock price? What's CRON stock price forecast? The Cronos stock clearly benefits from Wednesday's effective date for legal sales of recreational cannabis product in Canada. Marijuana investors have looked forward to October 17 for a long time. The stock has performed exceptionally well this year: it produced a remarkable return of 424%. Investors are bullish about Cronos because the company has major plans to increase the production of cannabis. On the other hand, some investors feel the company shares are overvalued. Cronos entered a joint venture with MedMen Enterprises to launch retail cannabis upon legalization in Canada. To increase the production, Cronos started a joint venture with an Israeli company Gan Shmuel. Cronos also reported that it formed a partnership with a technology institute in Israel, under which researchers will look at the potential use of cannabinoids in support of skin health and fighting skin disorders such as acne and psoriasis. In Australia, Cronos launched a subsidiary Cronos Australia for the research, production, manufacturing, and distribution of medical cannabis. The Cronos Group owns a 50% stake in Cronos Australia. 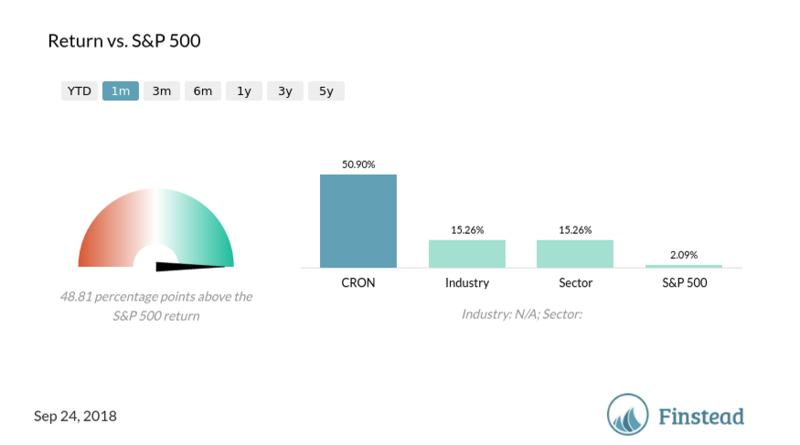 Over the last month, Cronos Group Inc. (CRON) returned +50.9%. Cronos Group Inc. (CRON) average analyst price target ($8.90) is -28.86% below its current price ($12.51). For the latest price and information on Cronos Group Inc., please visit Finstead and search for "CRON price" or "CRON news". Cronos Group (CRON) stock: trending positive, but is it overbought? Cronos Group Inc. (CRON) shares are trading at 10.35, down from $12.45 earlier this month. While the CRON stock seems to be trending downward, investors are wondering what is driving the stock price down? What's CRON stock price forecast? Cronos Group shares have yielded a return of 555% in the past year. The stock recently dropped around 28% after Citron released a bearish report on the company but managed to regain ground. Some investors are betting on the stock to take advantage of Canada’s marijuana bull market. The company operates two Licensed Producers (LPs) regulated within Health Canada’s Access to Cannabis for Medical Purposes Regulations (the ACMPR). It also holds a portfolio of investments in other Licensed Producers and ACMPR applicants. The company aims to diversify geographically and vertically integrate segments of the cannabis value chain. Revenue in the second quarter rose 430% to C$3.39 million and income came at C$0.8 million compared to C$0.2 million for the same quarter last year. The company has a cash position of C$90 million with a total liquidity of C$118 million. It raised C$100 million through an offering of common shares in April 2018. 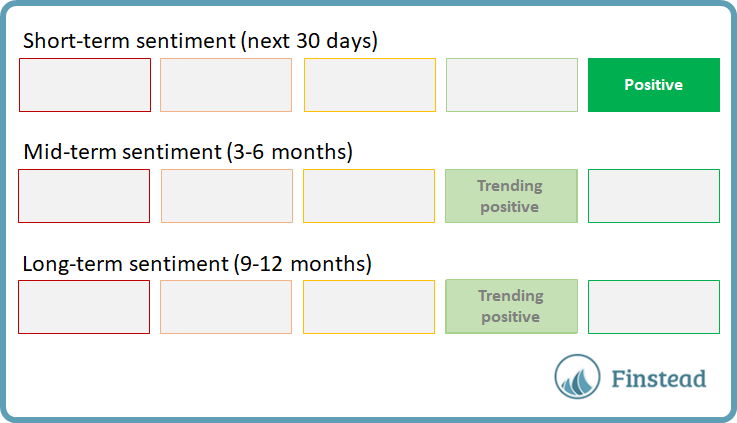 The long-term sentiment (9-12 months) trending is positive. 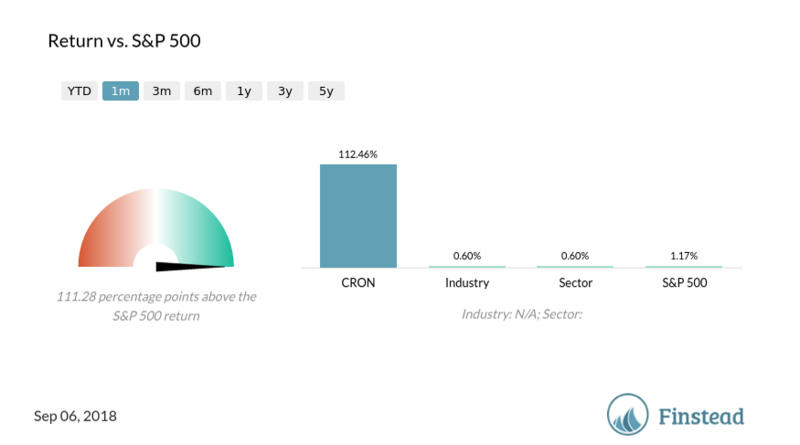 Over the last month, Cronos Group Inc. (CRON) returned +112.46%. Cronos Group Inc. (CRON) average analyst price target ($8.90) is -28.51% below its current price ($12.45). Cronos Group (CRON) price speculation: what's next? Cronos Group (CRON) stock was up 14% post market hours today. This company, formerly known as PharmaCan Capital Corp., is a principal investment firm that invests in businesses licensed to produce medical marijuana pursuant to Canada's Marihuana for Medical Purposes Regulations ("MMPR"). The CRON price stock is still significantly below this year's peak, $9.91, achieved in the March time frame. So what is the CRON stock price forecast? 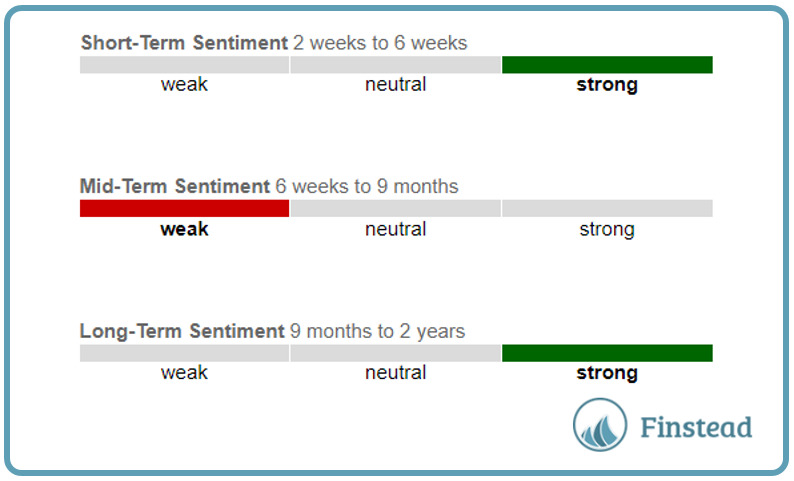 The technical analysis suggests strong short-term sentiment for Chronos, along with weak mid-term sentiment and strong long-term sentiment. 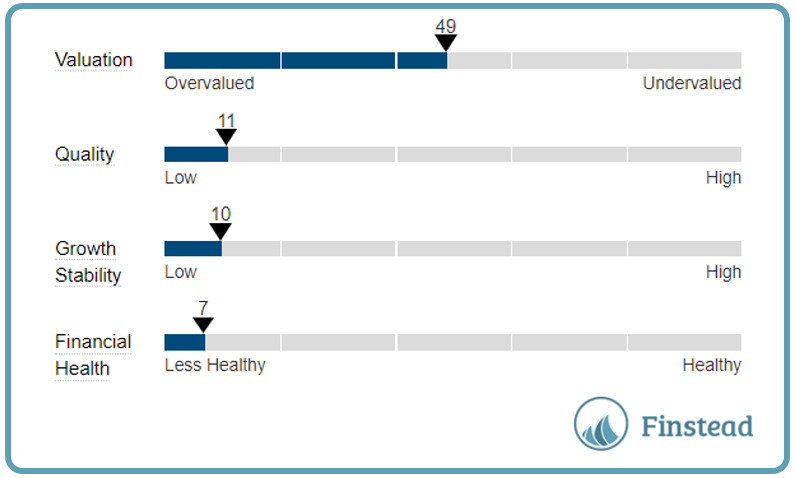 Market research firms such as Capital IQ suggest that Cronos is fairly valued, although the quality of the stock, growth stability and financial health are assessed as poor. The quality metric uses fundamental data to assess a company’s overall earnings quality in relation to its peers. This metric uses information across all financial statements of the firm. According to Finstead research, CRON average analyst price target is $9.04. Based on today's price, CRON price target upside is 14.00%. (visit Finstead.com and type "CRON upside" and "CRON price target" to get the latest data). Are you looking for the analysis of Cronos Group Inc. (CRON) stock? Are you wondering what the bulls and the bears say about it? If so, you came to the right place. 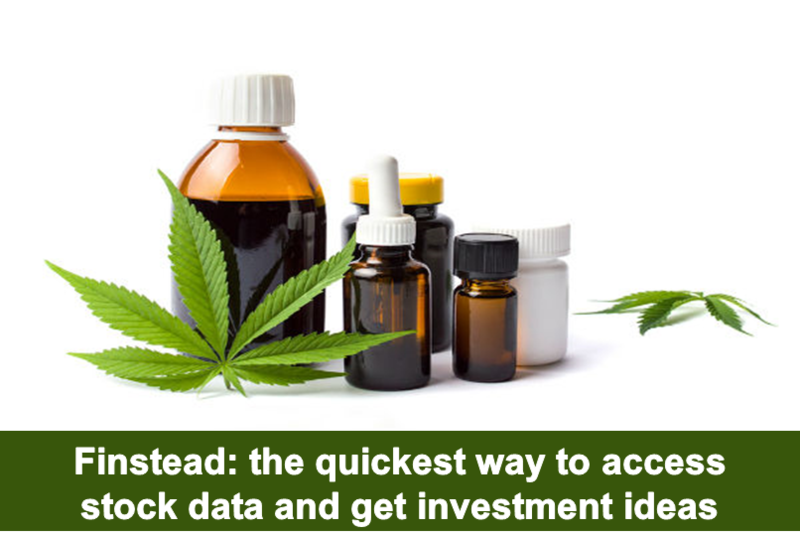 In this stock guide, we will share with you 3 reasons to buy and 3 reasons to sell CRON stock. You’ll get a perspective on what the bulls and the bears say about it. 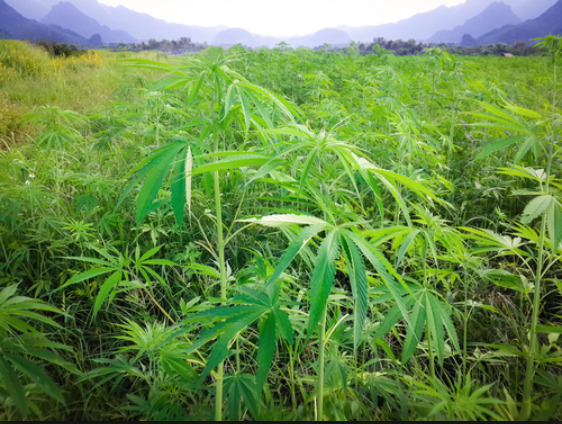 Is CRON a buy or a sell? Should I sell or hold CRON stock today? Is CRON a good buy / investment? What are CRON analyst opinions, recommendations and ratings? 1. Cronos has focussed on higher-margin alternate products which differentiate the company from other pot startups. This could play in the company's favor in the long-term. 2. The company's revenue growth is very solid. It has also partnered with Ginkgo Bioworks to produce Cultured Cannabinoids. 3. The company has closed a Canadian $2.4 billion investment of Altria group. With fresh funds, the company can focus on its strategic capital investments. 1. The company is lagging other cannabis companies in building its production capacity. 2. Investors are increasing worried about the company's high valuation. 3. 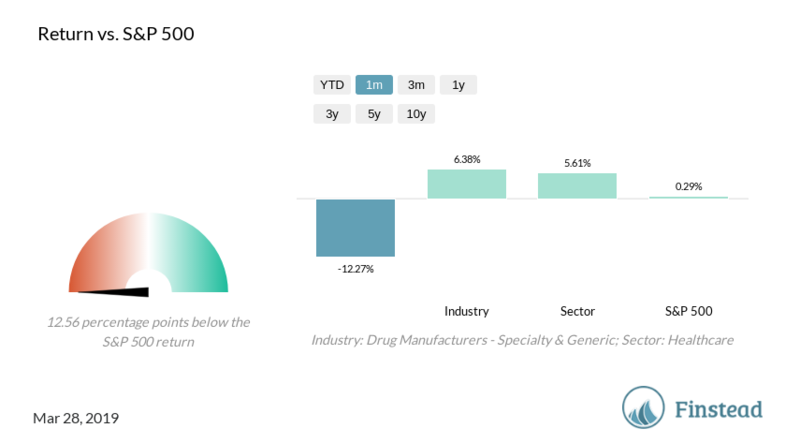 The stock has yielded a triple-digit return of 105% YTD. Investors are looking to book profits after the good run. What are your thoughts on CRON?